Imagining the crotales resonances as long threads stretching out from the bells was the image that suggested the approach to generating the musical material for frigate. The idea of braiding these long threads of sound became the algorithmic technique for organizing sequences that included all 25 bells of a 2 octave set of crotales. Starting with the chromatic scale as the prime sequence, a simple plaiting algorithm generated permutations of the prime set. The result created a large number of sequences that resembled change ringing/method ringing scores. But, unlike change ringing, the interest was in looking at the permutations as instances of a process, instead of presenting all of the permutations as an expression of the algorithmic process. Sequences were chosen based on qualities that featured unique musical gestures, as well as familiar patterns (chromatic scales, whole tone scales, etc.). The chosen sequences were isolated, ordered, and broken down into smaller musical fragments intuitively. Certain of these fragments became formal points within the composition, such as the chromatic glissandi with wire brushes, prominent whole tone scales, and smaller emphasis on particular intervals and pitches. The situation or set-up for the electronics for frigate also came with a clear vision. The electronic sounds needed to interact with the crotales in a direct way. For this reason the speaker generating the electronic sound is placed directly in front of (and slightly bellow) the bells –as opposed to using a wide stereo or multichannel array. For the same reason, the electronic sounds are in a similar tessitura as the crotales or in ranges above the fundamental of the bells, with some frequencies at or above the high limit of human perception. Having the bells as the lowest sounding objects was also a guiding principle for the work. The interaction of the sounding objects (crotales and speaker) happen on many levels, through the manipulation and projection of the crotales sound, through the close proximity of the sounds in the performance space and through the psychoacoustic interaction between sound objects and audience. To create this interaction a series of signal processing modules were combined in Max to create the electronic sounds. Envelope following, pitch tracking and spectral centroid tracking are the 3 types of signal analysis used to collect data from the crotales. This data is mapped directly to filter parameters and resynthesis engines to manipulate the crotales signal. Pitch information and envelope onsets also trigger generative synthesis processes that provide a type of accompaniment for the bells. Comb filtering is used to create false moving resonances (when mapped directly to the spectral centroid) and delay effects in certain moments of the work. FoF synthesis is also used to create attack like impulse that mimic the spectrum of the crotales. Aside from these signal processing engines mentioned above, the majority of the generated sounds come from sine tone oscillators. A bank of oscillators is used for resynthesizing information collected through spectral analysis, often with adjustments made to the frequency and amplitude of the partials to emphasize and exaggerate the timbral qualities of the crotales. In addition, there are also sine tone oscillators that use the same musical material as the score to generate a “ghost” part that performs in tandem with the musician. A difference tone engine is also used to generate “virtual” pedal tones, by using two oscillators at very high frequencies to produce difference tones in registers below the crotales. Finally, a single oscillator drifts at frequencies above human hearing to provide an indeterminate interaction with the sound field and audience. Given the nature of the sounds produced for the piece, the sampling rate for running the electronics is 96khz (as opposed to 44.1khz or 48khz). An audio interface and quality speakers and microphone(s) are required to produce the electronic sounds. The Max patch designed for the piece requires a Macintosh computer running OS X 10.4 or later. A MIDI interface for level control of the various engines is also recommended for the piece. The performance of the electronics is improvised within certain parameters. Cues to change preset parameters are triggered at the beginning of each rehearsal/measure number in the score. All engines run concurrently but are mixed in an improvised fashion so that often only a couple of the engines are sounding. The performer of the electronics for frigate must balance the output of the various engines with the crotales and can make spontaneous decisions about which aspects of the electronics to emphasize or mute while following the performance of the percussionist. 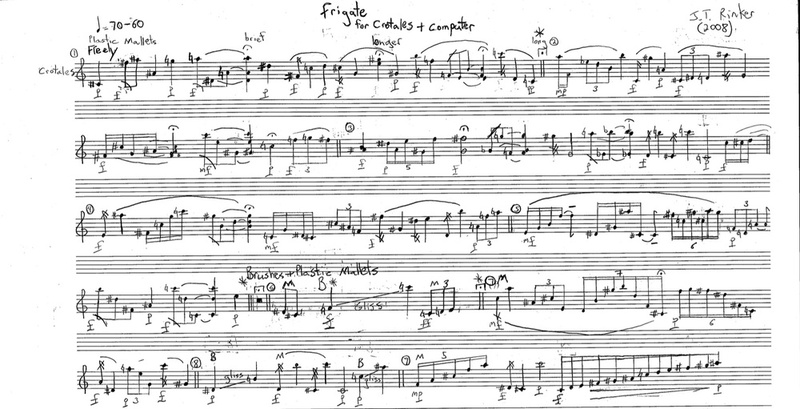 In this regard, each performance of frigate is different, through the interpretation of the percussionist, the performance of the electronics, the data collected by analysis, the randomness built into the synthesis engines and the space in which the piece is performed.